Hun Sen on Monday again be­came Cambodia’s sole prime minister, capping a five-year, five-month odyssey in which he relinquished nominal power, feuded with and later ousted his main coalition partner and outlasted his Khmer Rouge nem­eses. In a secret ballot on Monday, the National Assembly voted 99-13 to approve Hun Sen as prime minister for a five-year term. The same vote also confirmed a 25-ministry government and a political platform pledging widespread forestry and financial reform. “The 99, that includes two digits. It’s a very good number,” the new prime minister said when the vote was tallied. There were three abstentions and a spoiled ballot counted out by senior CPP parliamentarian Bou Thong in a house packed with politicians, diplomats, journalists and parliamentary aides. “The feeling I have today has made me the happiest I’ve been in the recent affairs of the electoral process, including the [July 26] election,” Hun Sen told re­porters on the steps of the Na­tional Assembly after the session. mis­sed the session, chaired by the Assembly’s first vice president, Heng Samrin. Five of 15 Sam Rainsy Party members have not returned to the country, and Prince Norodom Ranariddh, as Assembly president, is acting head of state in the absence of his father, King Norodom Sihanouk. Opposition leader Sam Rainsy in parliament Monday made good on his promise that his party would not vote in favor of the Funcinpec-CPP coalition. “To install the same people in government is a recipe for disaster and we will not support it,” Sam Rainsy said in a speech to fellow Assembly members. Cambodia’s government lost international recognition and millions of dollars in aid and loans after the July 1997 factional fighting that brought the collapse of the last coalition government, ousted Funcinpec’s Prince Ranariddh as first prime minister and left then-second prime minister Hun Sen in almost full control. 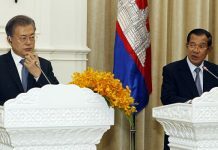 In a 10-minute session with journalists on the Assembly steps, Hun Sen expressed confidence in the coalition’s ability to last the full five-year term, pointed out that this government does not have to deal with the Khmer Rouge “headache” and hinted that he believes Asean will admit Cambodia in December. His comments followed a three­-hour parliamentary session in which he read a personal statement and the coalition’s proposed 19-page political plan. Hun Sen is expected to gain inter­national recognition for the first time as Cambodia’s sole prime minister. The government he headed from 1985 to 1993 did not have international recognition after the Vietnamese army invaded in 1979. UN-sponsored elections in May 1993 restored international recognition to Phnom Penh, but resulted in a Funcinpec victory and an ill-fated power-sharing arrangement of two prime ministers. Late Monday afternoon, a similar coalition government—but this time with Hun Sen as sole prime minister—was officially sworn in at the Royal Palace. As the sun dipped down over palace walls, scores of government appointees and acting Head of State Prince Ranariddh gathered at the palace’s opulent Khemarin Temple. Supreme Buddhist patriarchs Nuon Nget and Tep Vong arrived first in maroon robes and briskly climbed the red-carpeted stairs to the temple. The appointees then arrived by car, dressed in traditional saffron k’ben trousers and white jackets or blouses. Inside the temple, appointees signed their names in a book and seated themselves. Minister of the Royal Palace Kong Som Ol read a pledge, which the appoin­t­ees repeated with hands clasped in prayer. The appointees then blessed themselves with water from two small silver bowls held by palace staff. Outside the temple later, Prince Ranariddh and Hun Sen congratulated each other. “Today is one more historic day,” Prince Ranariddh told Hun Sen, saying that the coalition “baby” was born with great difficulty, but in good health. 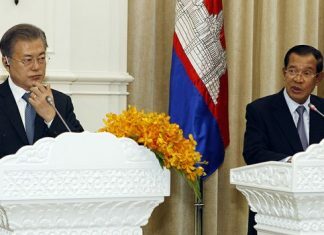 The prince then with a laugh asked Hun Sen to take care of Fun­cinpec members who are in government posts. Congratulated on the swearing-in of the government on the temple steps, new Secretary of State for Education Im Sethy warned that the government still has a lot of work to do. Sam Rainsy said his party supports the government’s intentions in its political plan but added that he doubts the coalition’s ability to carry it out. The coalition lineup is similar to the previous one that ended in bloody tank battles in Phnom Penh’s streets and allowed nu­merous forms of corruption, im­punity and “pillaging” of Cambo­dia’s natural resources to flourish, Sam Rainsy said. During Sam Rainsy’s speech, the CPP’s deputy Assembly chair­­men, Chem Snguon and Heng Samrin, asked the opposition leader to close his comments. At one point, Second Vice President Chem Snguon banged his fist on his desk. Yet, after Sam Rainsy finished speaking, Hun Sen walked across the aisle to shake his fiercest critic’s hand. Hun Sen later shrugged off the criticism and appealed to the opposition to restrict their arguments to “legal” criticism in parliament. 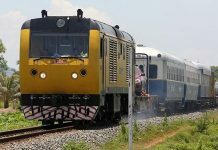 “I don’t mean that I want to ban any demonstration, but this [parliamentary] forum is the most influential one as it is broadcast on radio and TV for Cambodians across the country and abroad,” the prime minister said. The demonstrators called for Hun Sen to step down and pro­tested the result of the July 26 election, which saw the CPP carve out a nearly 10 percent victory over Funcinpec.